An extraordinary firework display lit up the heart of London on New Year’s Eve, signalling Britain’s readiness to welcome the world for the 2012 Olympic Games. For anyone involved in the central London property market, however, the world has already arrived. Exciting as it is, the recent influx of overseas investors and homebuyers that has priced all but the richest Britons off the streets of Kensington, Chelsea, Mayfair and Belgravia has undoubtedly changed the character of the capital in a few short years. In the long term, this may or may not be positive, but one thing is certain-the London property boom is set to continue for some time yet. Foreign ownership of London property is nothing new, of course. As Trevor Abrahmsohn of north London agents Glentree International reminds us, ‘international buyers have been buying meaningfully in the UK since the early 1970s. 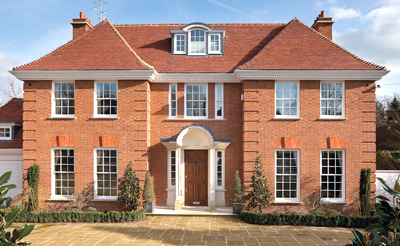 Currently, those keen to buy in Hampstead include eastern Europeans, Iranians, Indians, Greeks, Nigerians and Chinese. Most are businessmen or qualified professionals, and aged between 45 and 50-or younger in the case of the Russians. Sellers, generally aged between 60 and 80, tend to either downsize to an apartment in central London or retire to a property in the country, at the same time as retaining a pied-a-terre in the capital’. Newly built to the standards demanded by today’s international buyers, the aptly named Sahara (pictured) in fashionable Winnington Road, N2, is being offered by Glentree (020-8458 7311) at a guide price of £14.75 million. Set discreetly behind a wide, sweeping driveway close to Hampstead Heath, the 13,000sq ft mansion boasts every imaginable luxury, including a triple-height reception hall, three huge reception rooms, eight bedrooms, a spectacular leisure complex, a fully equipped cinema room, landscaped gardens and parking for a fleet of cars. ‘We don’t deal with English buyers any more; they just don’t have the money’, says a forthright Tom Dogger of Winkworth, whose patch covers Belgravia, Knightsbridge, Kensington and Chelsea. More typical of his present clientele is the Hong Kong-based owner of a classic Victorian terraced family house in Oakley Street, Chelsea, SW3 currently for sale through Winkworth (020-7589 6616) at £4.95m-who is seeking to repatriate his funds. Another foreign vendor is offering a five-storey, end-of-terrace house in ‘reasonable condition’ in elegant Eaton Terrace, SW1 as a freehold rental investment, at a guide price of £5.65m. ‘It has been said that you can walk down some of the most expensive streets in London these days and not hear an English voice,’ remarks urbane Chelsea agent Andy Buchanan of John D. Wood, whose cosmopolitan clientele remains at least 50% English-speaking. Chelsea’s unique village atmosphere has always attracted an eclectic mix of foreign and English buyers, and such is the appeal of this part of London that most successful sellers tend to buy another house in the area. An exception is the vendor of a large double-fronted house at 41/42, Godfrey Street, SW3, an American lawyer who is returning to the USAafter many years in London. Originally two identical houses, which were joined to create one 2,482sq ft, three-storey, family house with four reception rooms, three bedrooms, three bathrooms and two roof terraces, the property is on offer at £4m for the whole through Mr Buchanan’s Cale Street office (020-7352 1484), although local planners confirm that it could be reinstated as two individual units. Another charming Chelsea classic is two/three bedroom Wellington Cottage in Wellington Square, SW3, a beautifully maintained private garden square close to the Kings Road, Chelsea Green and Sloane Square. Its long-term English owner is retiring to Italy with his Italian wife, hence the sale of the house at a guide price of £5m through John D. Wood. ‘As little as 12 years ago, 10%-15% of central London buyers came from overseas; today those proportions are more like 60% in Kensington and Chelsea and 75% in Belgravia’, says Miles Meacock of Strutt & Parker’s new Notting Hill office (020-7221 1111). a foothold in London, and will try to maintain a city pied-a-terre’. A typical scenario was the recent sale, through Strutt & Parker, of 164, Kensington Park Road, Notting Hill, W11, a 2,210sq ft, four-floor family house, on behalf of an English couple whose children had long since left the nest. Last week they sold their house for more than £3m (against an asking price of £2.75m) with a view to moving to the country. But with both still working in the Royal Borough, they now rent a flat in Notting Hill, and plan to buy a smaller property there soon. As the gap between prices in central London and those in the country continues to widen, leading agents have identified a definite ‘ripple effect’ of successful vendors moving out of the centre to areas such as Wimbledon, Richmond and Chiswick, rather than the country proper. The perception is that the continuing influx of foreign, especially European, money flowing into the capital, will ensure that the London market maintains its upward path, as the country market continues to slide, with further falls expected in 2012. Hence the reluctance of London homeowners to completely sever their ties with the capital. a beautifully renovated, Grade II*-listed, six-bedroom Queen Anne house for sale through Savills (020-8877 1222) at £7.775m-plan to move nearer to the centre of town. The other five vendors all plan to move to the country. The owners of the substantial, seven-bedroom 12, Macaulay Road, SW4, for sale at a guide price of £5.5m, plan to move to Devon. The vendors of 10, Henderson Road, SW18, a 4400sq ft family house within Wandsworth’s famous ‘Toast Rack’ for sale at £2.995m, are moving to Dorset. Hampshire is the destination of choice for the vendors of the 3400sq ft 24, Hendrick Avenue, SW12, a stylish family house handily located between the Commons and on the market at £2.75m. The vendors of refurbished, five-bedroom, 60, Melody Road, SW18, for sale at £1.495m, are looking at Hampshire or Wiltshire, and the owners of four-bedroom 55, Ellerton Road, SW18, for sale at £1.075m, are planning a move to Buckinghamshire.